As 1958 nears an end San Francisco is being terrorized by a man who calls himself the “Fog City Strangler,” who preys on pretty young blonde women. The strangler announces each murder by sending a note and piece of cloth from the victim’s dresses to the local newspapers. Private eye Sam Slater is worried that the Fog City Strangler may be eyeing his beautiful blonde wife, stewardess Amelia Ryan. Sam’s angst mounts as the strangler continues to claim more victims. His anxiety is further fueled when TWA launches an advertising campaign with Amelia’s picture on a series of billboards plastered all over the city. Sam fears the billboards may attract too much attention--the wrong kind of attention. 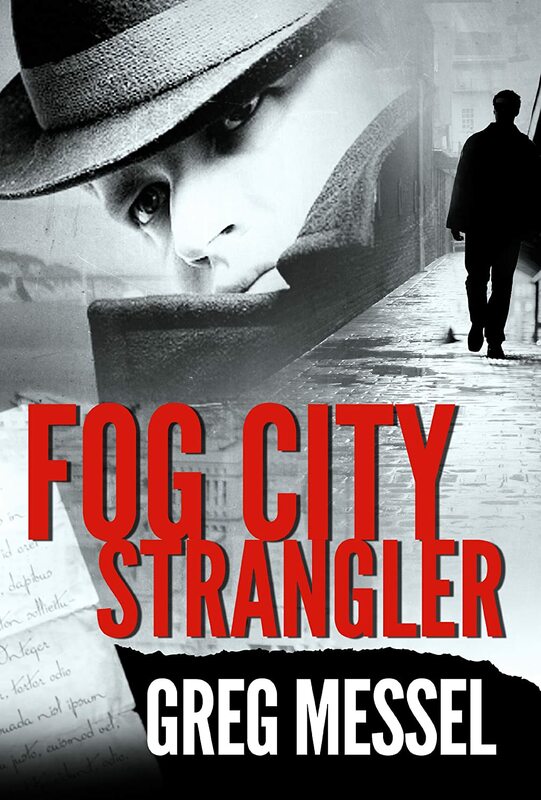 Fog City Strangler is a stand-alone thriller but is part of the Sam Slater Mystery Series--Last of the Seals, Deadly Plunge and San Francisco Secrets. Q: Hi, Greg. Welcome to Authors to Watch. Can you please tell us a little about yourself? A: I’ve written seven novels. The latest is "Fog City Strangler" which is the fourth in a series of mysteries set in 1958 San Francisco—“San Francisco Secrets," "Deadly Plunge” and "Last of the Seals." I’m currently working on his eighth novel--the fifth in the mystery series--"Shadows In The Fog"--which will be published in late 2014. For a more detailed summary of my novels go to www.gregmessel.com. I’ve spent much of his life in the Pacific Northwest living in Portland, Oregon and in the Seattle area since 2008. I’ve been married to my wife, Carol, for 40 years. I’ve lived in Washington, Oregon, California, Utah and Wyoming and grew up in the San Francisco Bay Area, graduating from high school there. I attended a year of junior college, then went to Brigham Young University I began a newspaper career in rough and tumble Wyoming town of Rock Springs. We have three married children and eleven grandchildren. A: I began writing when I was a child. I have an old canvas bag with crayon writing on it. It was my newspaper bag. I wrote the “paper” and then delivered it to neighbors and friends. I found the canvas bag in some things at my grandmother’s house after she died. I supported my self through high school and college being a stringer for local newspapers. Then after college I had a career as a sports writer, columnist and news editor. I finally got to try writing novels and published my first one in 2009. A: I make a basic outline for the plot. Sometimes I make a timeline to get the sequence of events set in my head. Then I start writing and let it evolve. My outline is not something I feel restrained by. I like how the story just develops and changes as you get into it. After I finish a book it’s interesting to look at my outline and see how much things changed. There were several key plot twists in “Fog City Strangler” which were not on my outline but were really important to the story. I live in Seattle and we have a lot of overcast, rainy days in the winter. I write at my desk which looks out on the street. I like to sit there on rainy days and write. A: “Fog City Strangler” takes place in the winter of 1958. There is a strangler preying on young, blonde women in San Francisco which is spreading fear throughout the city. Meanwhile, private eye Sam Slater and his partner Amelia Ryan are hired to find a woman who took a walk on the beach with her dog and seems to have vanished into thin air. Additionally, Sam is concerned that Amelia, who is a TWA stewardess, is being stalked by the Fog City Strangler. His fears are heightened after Amelia’s face starts appearing on billboards as part of a TWA ad campaign. A: I really like the main character, Sam Slater. He was a longtime baseball player and fought in World War II at Omaha Beach and the Battle of the Bulge. I hope that Sam is the kind of guy you would really like to hang out with and become his friend. I think I would. He is the anchor of the story. I think Amelia Ryan, his girlfriend and TWA stewardess, is a really interesting character and perfect match for Sam. However, Sam is a tough guy but very kind hearted. He has had a lot of tragedy in his life but still is positive. He gave up his prime years as a baseball player because he had to fight in World War II. Sam is a real man’s man which is why he appeals so much to Amelia. It was a different world in the 1950s. It was not a particularly friendly place--given our perspective now--for blacks or for women. The men were of the World War II generation and were pretty tough, macho guys. Sam exemplifies the men of that generation. Sam was a member of the San Francisco Seals pro baseball team. I got a chance to spend some time with a man who was actually a member of the Seals in their last season in 1957. I got some of the flavor of the times and what the “real” Seals were like. I used him as a technical adviser on men such as Sam in 1957-58. I also talked to a couple of men I know who were involved in the D Day landings and one of them fought in the Battle of the Bulge. They told me great stories which I used as part of Sam’s history. A: I love the books of Pat Conroy. I’m also a great admirer of Michael Connelly’s mystery books. A: I’m writing the next book in the Sam Slater mystery series—“Shadows in the Fog.” There is a young policeman who is very troubled by something that happened to him while working in Chinatown. His wife is a psychic who works at Playland at the Beach amusement park. She cannot find out what is troubling her husband but senses he is in real peril. Meanwhile, the mother of a young girl who disappeared two years ago, unexpectedly receives a letter from her daughter who she presumed was dead. A: I’ve found it very useful to sit down and write a detailed biography of each of the main characters. It makes writing so much easier. It helps you make decisions about who these people really are. Greg Messel grew up in the San Francisco Bay Area and now lives in Edmonds, Washington on the Puget Sound with his wife, Carol. 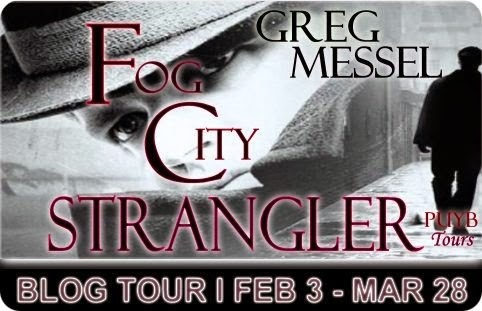 Fog City Strangler is his seventh novel and is the fourth in a new series of Sam Slater mystery novels. Greg has lived in Oregon, Washington, California, Wyoming and Utah and has always loved writing, including stints as a reporter, columnist and news editor for a daily newspaper. Something big slammed against the large floor-to-ceiling glass doors. Amelia raced to the other side of the room and cowered in case they might break. She heard noises outside on the deck and cautiously looked outside. A shadowy figure threw a large object which made a metallic sound when it clanked onto the deck. The man then turned and ran. She strained her eyes against the dense darkness. This heightened Amelia’s anxiety. She was very alone and vulnerable to the intruder who was just outside the glass door on the deck. Fear began to overwhelm her. She was afraid that something had happened to Sam. She knew he would never leave her defenseless. She reached for the flashlight on the table, clicked it on, and shone it out the glass door, but she could see nothing except her own reflection. As she walked closer the beam of her flashlight fell on a red gas can lying on its side on the deck. Amelia inched closer to get a better look and then instinctively recoiled as she saw flames racing across the deck outside the doors. Amelia was simultaneously confused and numbed with fear as she watched the deck become a wall of fire being buffeted by the high winds from the storm. She had to get out of there. Amelia turned and ran toward the bedroom door with the flashlight illuminating her path. She began shouting Sam’s name as loudly as she could. As she opened the bedroom door two shots rang out and ricocheted off the wall and doorframe above her head. Amelia squealed and retreated into the bedroom, slamming the door. She looked for a way to lock the door to protect herself from the assailant but it was an old-fashioned lock that required a skeleton key. There was so much noise from the fire roaring outside on the deck and the storm, that Amelia couldn’t tell if the shooter was pursuing her further or attempting to break down the bedroom door. She leaned against the door but knew she would be defenseless if the gunman wanted to force his way into the bedroom. Where was Sam? Was he okay? Who fired the shots at her? Who set the deck on fire? Amelia was now trapped between an unknown assailant outside her bedroom door and the fire raging on the deck on the other side of the glass doors. She had just moments to make a decision about how to escape. She decided to take her chances on the deck since the shadowy figure who fired the shots at her was undoubtedly just outside her bedroom. Amelia tried to grasp the door handle to the sliding glass door but it burned her hand, and she jumped back. She couldn’t figure out how to unlock it and didn’t have time in the darkness to deal with it. Amelia decided to take more direct action–she picked up a wooden chair and threw it at the large glass doors onto the deck. The chair cracked the glass but mostly bounced off of the door and fell onto the floor. She quickly scanned the room for something heavier that she could throw through the glass door. Amelia spotted a large metal paperweight on a writing desk in the bedroom. It looked like some kind of navigation tool from a boat. She cocked her arm and threw it as hard as she could at the cracked glass door. That did the trick, but the glass shards from the door went flying all over the bedroom floor and the deck. The breaking of the door only made her situation worse as the high winds now pushed the flames into the bedroom and closer to Amelia. The storm and the crackling of the fire, which exploded into the bedroom onto new sources of fuel, drowned out Amelia’s cries for help. Amelia began to tremble with fear at her dire circumstances. She had to not give up and make another attempt to escape. She eyed the bedroom door. She had no choice but to open it and confront whatever was on the other side. Sam had taken his gun when he left moments ago leaving her unarmed. The helpless Amelia stood in front of the closed bedroom door, and glanced over her shoulder at the advancing flames being whipped by the windstorm into a swirling inferno. Amelia didn’t know what awaited her on the other side of the door but she was going to have to make a break for it. She took a deep breath and then rushed for the door. When she grabbed the knob and turned, it was locked. Someone had used a skeleton key to lock her in the burning bedroom. Greg Messel is giving away a 3 book set of his Sam Slater Mystery Series (Last of the Seals, Deadly Plunge and San Francisco Secrets AND a $25 Amazon Gift Card! One winner will be chosen via Rafflecopter to receive the 3 book set and $25 Amazon Gift Card. This giveaway begins February 3 and ends on March 28. Winner will be contacted via email on Monday, March 31, 2014.